Widely Unrecognized Benefits of a Human Rights Approach as a Remedy for Climate Change: A Comprehensive Series. This is the first in a series that will rigorously examine the importance of understanding climate change as a human rights problem. There is a large and growing literature that examines links between human rights and climate change. This series will summarize the main conclusions of this literature while making additional arguments about the benefits of examining climate change as a human rights problem that can be deduced from almost seven decades of international human rights law. This series will conclude that those who see climate change as a civilization challenging moral and ethical problem will find many practical lessons to be learned from human rights law and its philosophical foundations that should help achieve a greater response to climate change consistent with national, regional, and individual ethical and moral obligations. These lessons will include: (a) substantive conclusions about obligations that follow when specific rights that are violated. (b) procedural lessons about increasing compliance with rights obligations that can be seen by examining almost 65 years of continuing development of international human rights law at the international, regional, and national scale, (c) and specific ideas about how to get nations to take their ethical and equity obligations seriously in international climate change negotiations. The series will end with recognition of some challenges to a human rights approach to climate change. yet with an explanation why despite these challenges, greater use of human rights should be made to find a solution to climate change. II. Climate Change Prevents Enjoyment of the Most Basic, Non- Controversial Human Rights and as a Result Certain Practical Consequences Follow. The Caney paper explains that climate change violates many human rights including three of the most fundamental least controversial rights: (1) right to life, (2) right to health, and (3) right to subsistence. Climate change violates the right to life because a changing climate will and is killing people through more intense storms, floods, droughts, and killer heat waves. Climate change will violate the right to health by increasing the number of people suffering from disease, death, and injury form heatwaves, floods, storms, fires, and droughts, increases in the range of malaria and the burden of diarrhoeal diseases, cardie-respiratory morbidity associated with ground level ozone, and increase the number of people at risk from dengue fever. Climate change will violate the right to subsistence by increasing: (a) droughts which will undermine food security, (b) water shortages, (c) sea level rise which will put some agricultural areas under water, and (d) flooding which will lead to crop failure. Caney explains that other human rights are affected by climate change but an understanding that climate change violates these three rights puts the claim that climate change violates human rights on the most uncontroversial grounds. Caney also explains that climate change is also morally objectionable on other grounds than human rights including non-anthropogenic moral grounds. Caney further explains in the article that because climate change clearly violates human rights, certain things follow. If climate change is a human rights problem, compensation is due to those whose rights have been violated. 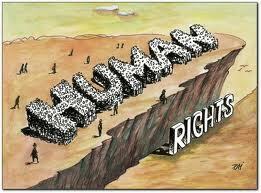 The human rights approach generates both duties for mitigation and adaptation. It also generates duties of compensation for harm. Human rights apply to each and every human being as they are based on the idea that all human beings are born free and entitled to certain rights. If one has a right not to suffer a particular harm, then it is wrong to violate that right because one can pay compensation. It is for instance wrong to assault someone even if the person assaulted can be paid compensation for the harm. If the human rights of the most vulnerable are being violated they need not bear the burdens of mitigating the threats. Human rights usually take priority over other human values such as efficiency and promoting happiness. Caney, Simon, 2010, Climate Change, Human Rights and Moral Thresholds, in S. Gardiner. 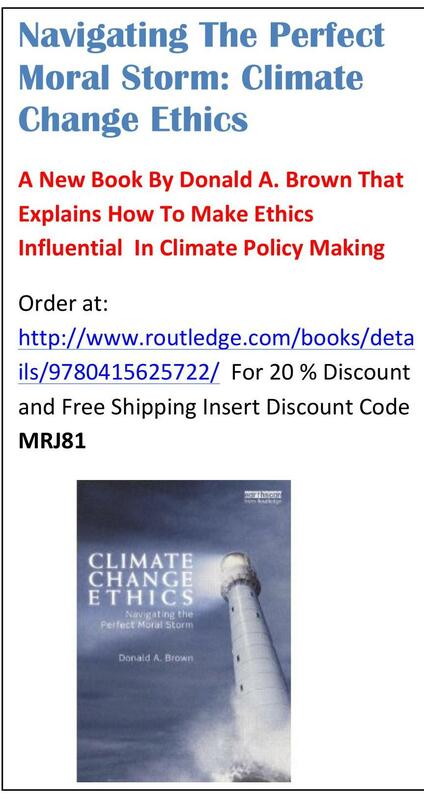 S. Caney, D. Jamieson, H. Shue (editors), Climate Ethics, Essential Readings, Oxford University Press, New York, 2010. Part-time Professor, Nanjing University of Information Science and Technology, Nanjing, China. Has Discussion Of What “Equity” Requires Of Nations To Reduce GHG Emissions Disappeared From Climate Negotiations? If So, What Should Be Done About It? Has the leadership of international climate negotiations under the UNFCCC lost the desire to require nations to expressly examine what “equity” requires of them? Recently there has been no evidence that the UNFCCC Secretariat or the leadership of the Ad Hoc Working Group on the Durban Platform for Enhanced Action (known as the ADP) has any intention of discussing the meaning or practical significance of “equity” in climate negotiations. This paper examines: (a) what has happened recently in climate negotiations in regard to national obligations to reduce ghg emissions reductions on the basis of equity and justice, (b) arguments that have been made in support of ignoring express discussion of equity and justice issues in climate negotiations, (c) arguments in support of a greater focus on equity and justice at both the international and national levels, and (d) what should be done to increase the focus on equity and justice in light of the resistance of nations to acknowledge their equitable and justice obligations. The ADP is a subsidiary body under the UNFCCC. It was established in 2011 with the mandate to develop a “protocol, another legal instrument or an agreed outcome with legal force” under the Convention applicable to all Parties, which is to be completed no later than 2015 and to come into effect in 2020. While there have been negotiations under way on the new agreement, there has also been an attempt to increase national commitments on greenhouse gas (ghg) emissions reductions in the short-term because mainstream science is telling nations that much greater reductions in emissions are necessary in the next few years to maintain any hope of keeping warming below 20 C, a warming limit that all nations have agreed should not be exceeded to give some hope of preventing catastrophic warming. In fact, the international community has understood that much more ambitious commitments are necessary, both in the short- and long-term to maintain any hope of keeping warming to tolerable levels. For this reason, the agendas of the last few Conferences of the Parties (COP) UNFCCC meetings have sought to increase the ambition of nations to increase their ghg emissions reductions commitments both in the short- and long-term. There has also been a fairly wide-spread understanding that the international community will not avoid very dangerous climate change unless nations increase their national commitments to levels required of them based upon equity while working with other nations to keep atmospheric concentrations of ghg from exceeding dangerous levels. Two years ago it appeared as if the ADP was proceeding to seek some agreement on what equity requires under the UNFCCC. 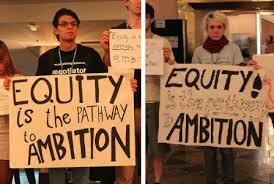 In May of 2012, the UNFCCC held a workshop on equity in Bonn. A report on the workshop is on available. As expected, nations were not able to come close to agreeing on what equity requires at this initial Bonn workshop. Yet, the workshop concluded that a work program on equity is needed and made a decision that “equity” should be taken up at COP-18 in Doha, Qatar. 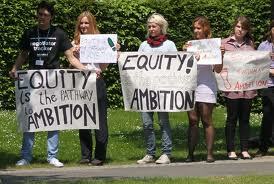 There was no focused discussion of “equity” in Qatar despite the recommendation from the Bonn workshop. The United States opposed language in the final Qatar document that included language on “equity” according to the report on COP-18 by the Earth Negotiation Bulletin http://www.iisd.ca/vol12/enb12567e.html. Is this the reason why discussions on “equity” were not resumed in Qatar? The public record is not clear. Nor was there any focused discussion on “equity” in Warsaw at COP-19 with the exception of a proposal pushed by the Brazilian government and 130 other nations to define equity in a way that took historic responsibility into account. The United States, the EU, Canada, and Australia refused to discuss this proposal. And there was virtually no discussion of what equity would require of nations in regard to emissions reductions commitments in the last few years at the UNFCCC annual meetings which seek to create an adequate global solution to climate change. The Warsaw meeting did discuss “co-benefits of climate change commitments” at the urging the UNFCCC leadership thereby implicitly reverting to a category of self-interest rather than national obligation. Co-benefits were discussed presumably to convince nations that it was in their national economic interest to adopt climate policies, a tactic which may implicitly confirm the notion that national economic interest rather than national obligations should be the basis for climate change policy. And so it would appear that discussions of what equity would require of nations to increase their ghg emissions reductions commitments is no longer on the UNFCCC agenda. Yet nations have already agreed under the UNFCCC to adopt programs and measures to prevent dangerous climate change based upon equity and common but differentiated responsibilities. We might add, however, even if nations did not agree to reduce their emissions based upon equity, basic and uncontroversial theories of justice would require nations to reduce their emissions to their fair share of safe global emissions. However most nations are making ghg reduction commitments based upon national economic interest, not on their fair share of safe global emissions. Differences among nations about the significance of equity and justice plagued the Warsaw meeting in regard to funding for adaptation and loss and damages, yet the ADP discussions never took up express consideration of what equity would require in regard to these issues either. This failure to discuss equity is somewhat curious given that there has been a strong level of agreement among many observers to and commenters on the climate negotiations that if nations are going to increase their ambition on ghg emissions reduction to levels that prevent catastrophic warming, they will need to make commitments based upon their equitable obligations to keep atmospheric ghg concentrations to safe levels rather than on self-interest. That is, without a recognition by nations of their ethical and justice obligations to the rest of the world to reduce their emissions to their fair share of safe global emissions, there is little hope of preventing catastrophic warming. Based upon the negotiations in Warsaw at COP-19, it would appear that the future treaty that was agreed to in Durban in 2011 and is to be finally negotiated in Paris in 2015 will be comprised of “bottom-up” pledges without any formal recognition or operational definition of equity. Although it is possible that “equity” could be taken up in a meeting scheduled for March in Bonn this coming year, it would appear that at least for the moment, the UNFCCC secretariat has abandoned any hope of getting nations to operationalization “equity” in the negotiations. In fact, several observers of the negotiations have advised the international community to abandon any direct discussion of “equity” because it is too contentious. This paper reviews some of the reasons that have been advanced for avoiding any direct negotiation of what “equity” requires along with arguments for resumption of negotiations expressly focused on equity. Finally this paper argues for continuance of a discussion on “equity” that anticipates some of the problems that have arisen when equity has been previously discussed in the negotiations. Several observers of the climate negotiations have counseled against any further direct negotiation of “equity” because it is too contentious and will not likely lead to agreement. For instance, a recent World Bank paper recommends that climate negotiations abandon attempts to achieve national ghg emissions reductions commitments based upon “equitable” obligations after a somewhat rigorous review of the extant literature on “equity” and a brief summary of what has happened in the negotiations. The paper is entitled “Equity in Climate Change, An Analytical Review.” The paper identifies four formula or frameworks for operationalizing equity under the UNFCCC that have appeared in the relevant literature. These include emissions allocated: (i) equally on a per capita basis; (ii) inversely related to historic responsibility for emissions; (iii) inversely related to ability to pay; and (iv) directly related to future development opportunities. The paper argues that none of these formulae have attracted sufficient support because each is dramatically inconsistent with many nations’ national interest and therefore will not likely receive the level of consensus required in international negotiations. In light of the fact that any attempt to reach consensus on the operationalization of equity will run into conflicts with national interest, the paper recommends a completely new approach that would fund a new carbon revolution while abandoning the current approach in which nations make individual emissions reductions commitments consistent with what equity requires of them. Equity considerations, according to the paper, would then play a role, not in allocating a shrinking emissions budget, but in informing the relative contributions of countries to funding a technological revolution. The World Bank paper further asserts that conflicts of interest are created by any of the equity formulas that have been advanced that are both inherent and stron. They are inherent because any allocation must distribute a fixed aggregate carbon budget. They are strong because the budget is not really fixed but shrinking dramatically relative to the growing needs of developing countries. Since mainstream science has concluded that drastic compression in aggregate emissions is now necessary to keep temperatures below dangerous levels, shrinking emissions budgets are likely to require even greater ghg emissions reduction commitments that are in even greater conflict with national interests. Therefore, the paper recommends abandoning negotiations about “equitable” emissions reduction commitments and attack climate change through commitments on funding climate friendly technologies. Others have also recommended abandonment of “equity” considerations because any reasonable definition of equity would require nations to agree to cuts that were not in their national interest coupled with the fact that there is no consensus about what equity requires. It would appear that these people believe that if nations cannot agree on what equity requires it is unproductive to discuss equity in climate negotiations. They appear to fear that discussions of equity will lead to no agreement. 1. Nations have been entering negotiations as if only economic national interest counts and in so doing have failed to make emissions reductions commitments based upon equity that in the aggregate will avoid dangerous climate change. In fact, when some nations have been asked to explain why they have not made more ambitious commitments, they have frequently justified their unwillingness to make greater commitments because such reductions are not in their economic interest. For this reason, it is likely a practical mistake to not insist that any national commitment conforms to some reasonable definition of what equity requires. To ignore this obligation is to encourage the continued dominance of national self-interest in national responses to climate change. 2. Although there is some reasonable disagreement on what equity requires, this fact should not relieve nations of the obligation to demonstrate that their emissions reductions commitments are based upon reasonable expectations of fairness and distributive justice. Some nations seem to be arguing that because there are differences among nations about what equity requires, this is justification for totally ignoring equity and justice issues entailed by making allocations among nations. Because allocation of national ghg emissions is inherently a matter of justice, nations should be required to explain how their ghg emissions reduction commitments both will lead to a specific atmospheric greenhouse gas concentration that is not dangerous, that is, what remaining ghg CO2 equivalent budget they have assumed that their commitment will achieve, and on what equitable basis have they determined their fair share of that budget. Any national ghg emissions reduction is implicitly a position on a safe atmospheric ghg concentration and that nation’s fair share of total global emissions that will reach that target. Because of this, nations should be required to expressly disclose their assumptions on safe global emissions and what fairness requires of them because such assumptions are implicit but usually hidden in their commitment. 3. Although there may be some reasonable disagreement of what equity requires among various equitable frameworks that have been proposed, this does not mean that any proposal for what equity requires is entitled to respect. The problem of allocating emissions reductions among nations is a classic problem of distributive justice. Distributive justice allows people to be treated differently but requires that those who want to be treated differently from others in some distribution of public goods identify a morally relevant justification for being treated differently. For instance, a person whose justification for obtaining a larger share of food is the fact that he or she has blue eyes will not pass ethical scrutiny because the color of someone’s eyes is not a morally relevant justification for different treatment. Similarly a nation’s justification for the refusal to reduce ghg emissions is that reductions in emissions will affect the nation’s economic interest is not a morally relevant justification for refusing to cut ghg emissions. If it were any polluter could justify continuing to pollute as long as pollution controls cost the polluter money. Because many of the justifications for national ghg emissions commitments are based upon economic self-interest, rather than ethical duty to others, these justifications fail to satisfy minimum ethical scrutiny. And so, strong claims can be made that certain justifications for national commitments on ghg emissions reductions fail to pass any reasonable ethical analysis even though one cannot say absolutely what perfect justice requires. It is therefore fairly easy to spot ethical problems with national ghg commitments even though one cannot claim unambiguously what justice requires. Therefore it is possible to get traction for ethics and justice issues despite disagreement on what justice precisely requires. 4. Although reasonable people may disagree on what equity and justice may require of national ghg emission reduction commitments, there are only a few considerations that are arguably morally relevant to national climate targets. In discussing equity and the distributive justice of national commitments, the relevant criteria for being treated differently that have been recognized by serious participants in the debate about equity include: (a) per capita considerations, (b) historical considerations, (c) luxury versus necessity emissions, (d) economic capacity of nations for reductions, (e) levels of economic development, and (f) and combinations of these factors. The fact that reasonable people may disagree about the importance of each one of these criteria does not mean that anything goes as a matter of ethics and justice. In addition, the positions actually taken by nations on these issues in the negotiations utterly fail any reasonable ethical scrutiny. For this reason, discussions on equity should focus heavily on the obvious injustice of national positions on these issues rather than worrying about what perfect justice requires. Some reasonable compromise among these criteria should be a goal of the negotiations. In fact, a global framework for equity would include some forward looking considerations including per capita considerations and backward looking considerations such as historical responsibility from a specific date, modified by certain economic considerations including economic ability to respond rapidly and perhaps differences between necessity emissions and luxury emissions. 5. The insight that nations will not agree to what equity requires of them because it is not in their national interest should not be the basis for abandoning an equitable approach to climate change as recommended by the above referenced World Bank paper because national interest is not a morally acceptable justification for national climate change policy yet it is likely to remain the criteria for setting national climate change policy unless a nation is shamed for its ethically bankrupt position on climate change. The fact that changes in national responses to ethically unacceptable behavior can be demonstrated from the spread of human rights around the world which can be attributed to shaming nations for their failure to provide human rights protections. The same naming and shaming approach to equity and national ghg emissions reductions commitments should be followed on climate change emissions reductions commitments by adopting better understanding of the ethical bankruptcy of some nations’ approach to climate change. 6. The need to turn up the visibility on the ethical and equitable unacceptability of national ghg commitments is not only important to get nations to increase their emissions reductions commitments in international negotiations, it is also important to change the way climate change policies are debated at the national level when climate change policies are formed. For instance, when some nations including the United States and New Zealand have debated climate change policies at the national level there has been a complete failure to acknowledge that proposed policies must respond to the nation’s equity and ethical obligations. Because of this, national economic interest rather than global obligation dominates debates on proposed climate policies at the national level. There is an important need to change the focus of national debates on climate change policies at the national scale so that citizens understand the ethical problems with their country’s national commitments. And so, there is an important need to increase awareness of the equity and justice issues entailed by national climate change policy debates. For the reason stated above, there is an urgent need to increase the focus in international climate negotiations and at the national level on equity and justice and simply ignoring these issues because they are difficult or contentious is likely a huge practical mistake that has potential catastrophic consequences. However, given the resistance thus far on nations’ willingness to openly discuss the equity and justice dimensions of their climate policies, the first order question is how to do this. Because of the unwillingness of nations to agree on what equity requires of them, initial steps should be taken to increase awareness of the ethical and justice failures of national responses to climate change. A. What specifically is the quantitative relevance of your emission reduction commitment to a global ghg emissions budget to keep warming below a 1.5 °C or 2°C warming target. In other words how does your emissions reduction commitment, in combination with others, achieve an acceptable ghg atmospheric concentration that limits warming to 2°C or the 1.5°C warming limit that may be necessary to prevent catastrophic warming? B. What is the atmospheric ghg concentration level that your target in combination with others is aiming to achieve? C. How specifically does your national commitment take into consideration your nation’s undeniable obligation under the UNFCCC to base your national climate change policy on the basis of “equity.” In other words, how have you operationalized equity quantitatively in making your emissions reduction commitments? D. What part of your target was based upon “equity”? c. your country should have applied the precautionary approach to climate change policy since 1992 when the UNFCCC was adopted? F. How does your national ghg target commitment respond to these settled principles of international law? G. In debating national climate policy, to what extent have you apprised citizens of your country that nations have ethical and justice responsibilities to other vulnerable people and nations? H. To what extent have you informed high emitting entities and individuals within your nation that they have ethical responsibilities to decrease their ghg emissions in cases when this can be done without a major sacrifice to an entities or individual interest. 2. Because debates about climate change policy formation at the national level have often ignored questions of equity and fairness, there is a need to publicize how debates at the national level about proposed climate change policies acknowledge or ignore questions of equity, ethics, and distributive justice. To accomplish this, researchers around the world should be requested to report on and document how ethics and equity issues are being considered in public policy debates about national policy within each country. This analysis should determine, among other things, the extent to which the debate about climate policy has specifically considered an atmospheric ghg concentrations goal and on what equitable and distributive justice basis has the target commitment selected. 3. There is a need to establish an international data base on how nations have considered equity and distributive justice issues at the national level and specific excuses that nations have relied upon for their failure to support an ethically justifiable international climate regime. 4. The starting point for any negotiations session under the UNFCCC should be a submission by each government on their position on their equitable obligations for issues under negotiation. This submission should be detailed to include specific ethical issues under consideration during each negotiation. 5. Each nation should be required to identify what policy steps it is taking to provide, protect, and fulfill the human rights that may be adversely affected by climate change to both people in their own country and vulnerable people around the world. 6. As part of climate negotiations, each national commitment to reduce ghg emissions should be reviewed by a panel of experts who would evaluate each national commitment to reduce ghg emissions on its merits as a matter of distributive justice.